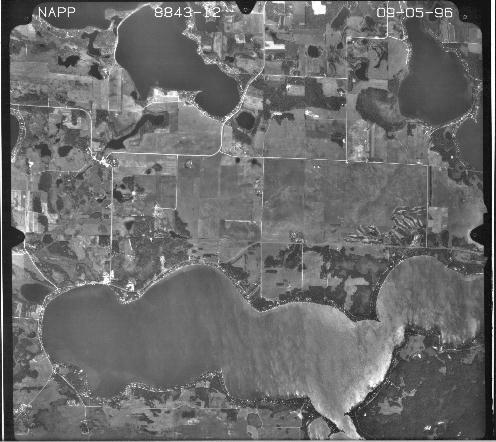 Aerial photographs archived and distributed by the USGS include the repository of multiagency National Aerial Photography Program (NAPP) photos at 1:40,000 scale in color infrared or black and white; National High Altitude Aerial Photography Program (NHAP) photos at 1:58,000 scale for color infrared and 1:80,000 for black and white; and aerial photos at various scales from USGS mapping projects and other Federal agencies such as the Bureau of Reclamation, Environmental Protection Agency, and the U.S. Army Corps of Engineers. Maps showing locations of each aerial photograph may be viewed on-line. An example shows Cormorant Township, Becker County, MN.